In 1886 the Manitoba and Northwestern Railway (now Canadian Pacific) lay its track through Birtle. Birtle’s Member of Parliament in the Manitoba Legislature, E.P. Leacock, and Mayor Crawford worked hard to lobby the Railway company to change its route so that it passed through Birtle rather than going a more northerly route to Seaborn-Russell. The second map shows the CP rail line making a sharp dip from Solsgirth, southwest to Birtle, and then continuing up to Binscarth and westward. This was no small feat and cost the Town of Birtle $30,000 in bonuses and concessions to the railway company. Having the railway come through Birtle gave the town a huge advantage in its ability to bring settlers and supplies to the town. 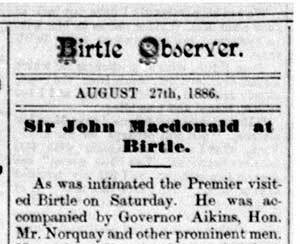 Sir John A. Macdonald just happened to be in the province the time the rail line to Birtle was completed. Land Agent, W.G. Pentland (who had strong ties to the Conservative party and the Prime Minister) along with the Town Council thought it would be fitting that he visit Birtle to commemorate the railway arriving to town. 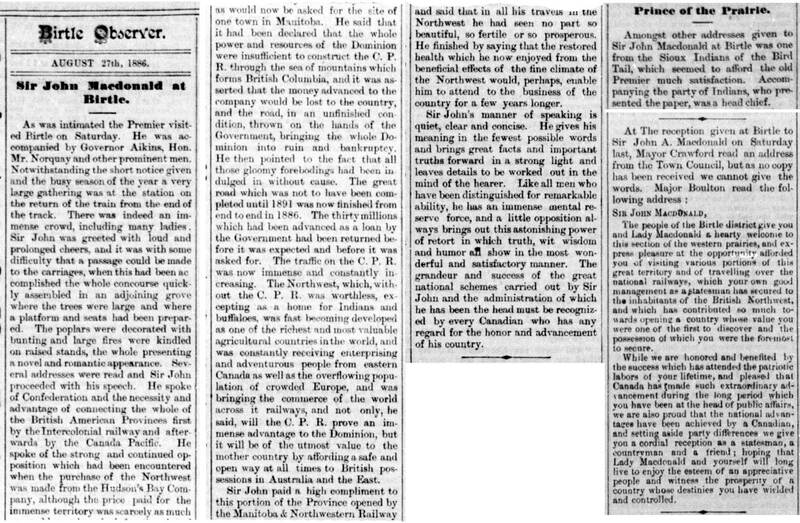 On August 20, 1886, a meeting was called to make arrangements to receive Sir John A. MacDonald. A committee of Mayor Crawford, Alfred Morton and W.G. 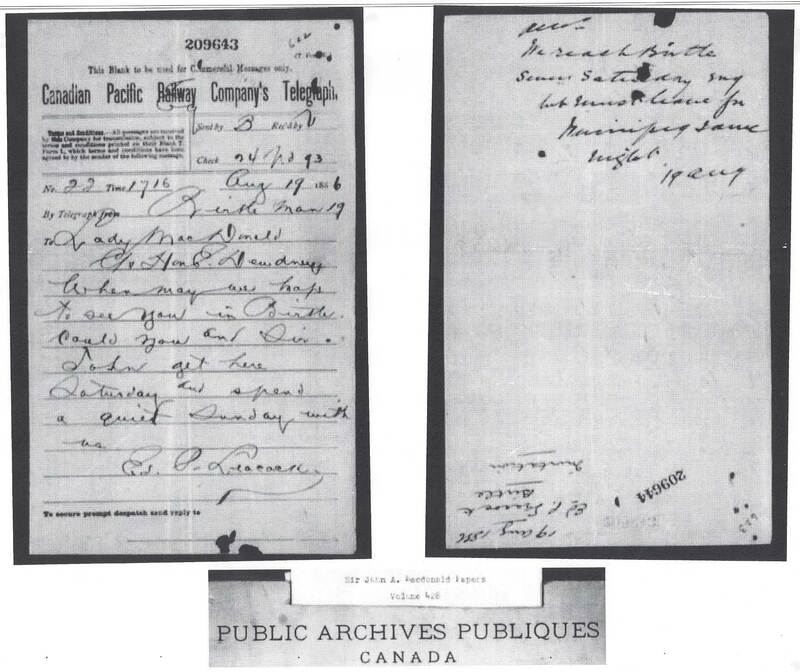 Pentland, Chairman of the Reception Committee, telegrammed Sir John A. Macdonald asking him to make a brief stop at the Birtle Railway to address the people. 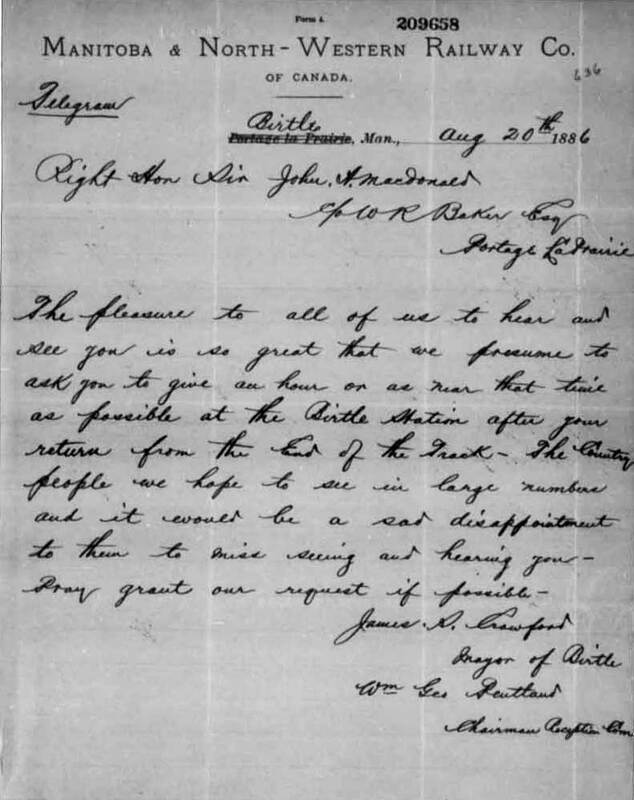 Pentland sent his telegram on August 20th. Edward Leacock, MLA for the area, also sent a telegram the day before. 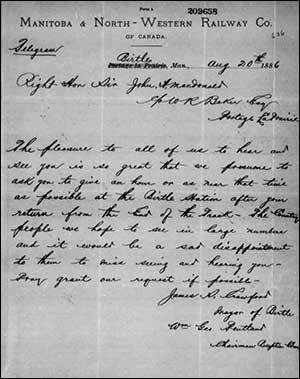 To see a larger version of the telegrams, click on the images below. Sir John A. Macdonald and Lady Macdonald accompanied by Governor Aikens and the Premier of Manitoba, Mr. Norquay, arrived to a large crowd at the train station. For a detailed description of the event, click on the article from the Birtle Observer, for August 27, 1886, below. Return to the Moments in History list.